Made to a delicious recipe of freshly prepared British chicken, carrots and rice. This complete and nutritionally balanced meal is 100% natural and contains all the essential nutrients your dog needs for a healthy diet. 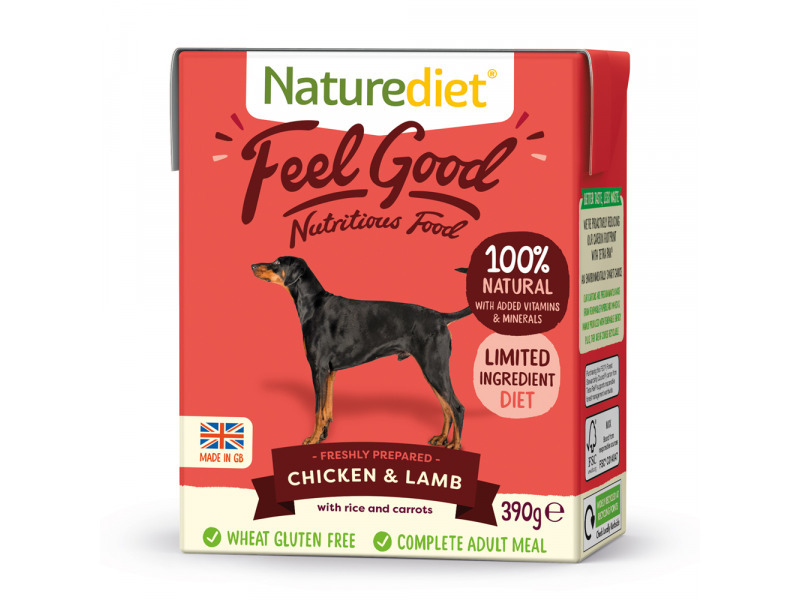 Gently digested and highly palatable, this tasty single protein chicken meal is suitable for all breeds of adult and senior dogs, as well as puppies over 6 months old. Made with tender British Lamb, nourishing rice and a selection of healthy vegetables. This delicious single protein meal is 100% natural and gently steam cooked. A complete meal which will provide your dog with all they essential nutrients they require for a healthy, balanced life. A mighty meaty meal, irresistible to dogs. Premium quality cuts of chicken and lamb served accompanied by carrots and rice, this 100% natural meal is complete and balanced to provide essential nourishment for optimum canine health and well-being. A naturally nourishing, gently steam cooked meal that’s suitable for all breeds of adult and senior dogs, as well as puppies over 6 months old. Made with ethically sourced, British ingredients and completely free from artificial nasties. Made from tasty British turkey & chicken meat with wholesome rice and veggies, freshly prepared and gently steam cooked. 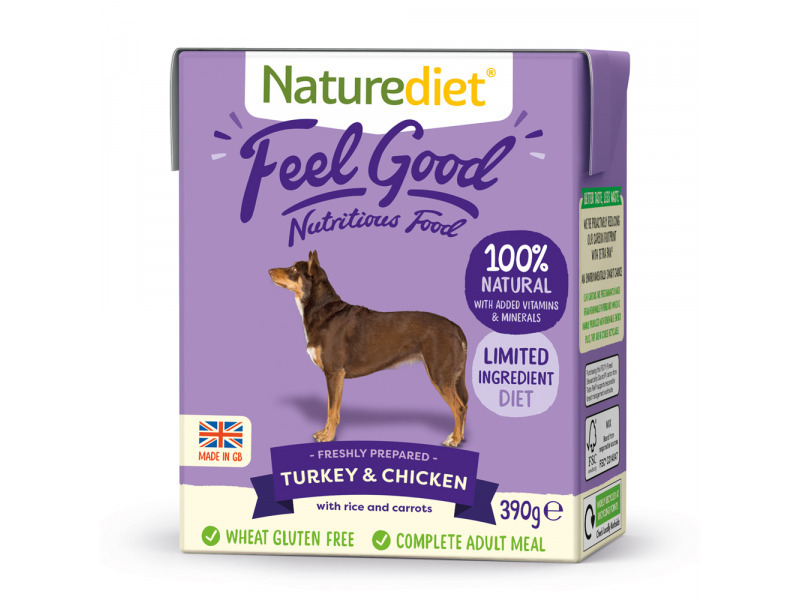 Feel Good Turkey & Chicken has been carefully created to provide optional nutrition from essential ingredients to keep your dog in tip-top condition. Feel Good Turkey & Chicken is a complete, balanced nutritious meal, free from preservatives, artificial additives and wheat gluten. A 100% natural, delicious meal for dogs made with the highest quality human grade ingredients. 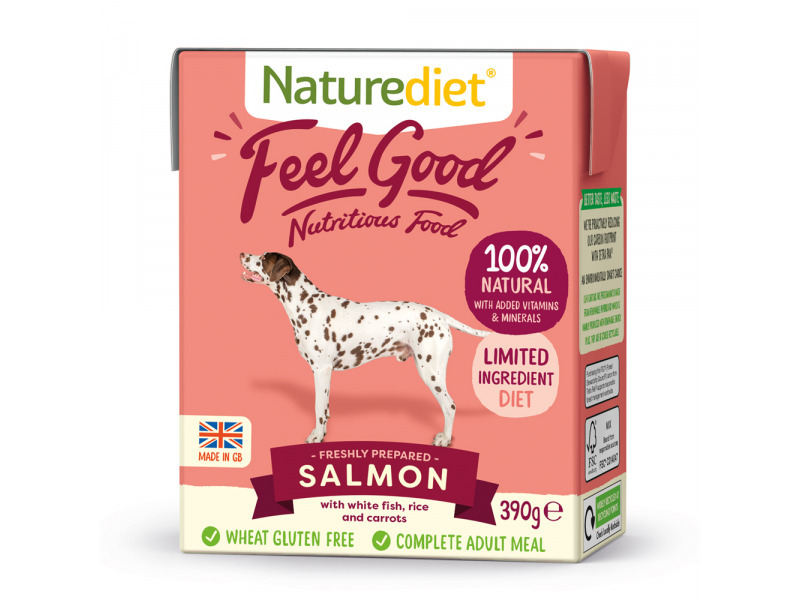 Rich in omega 3 fatty acids for super healthy skin and coat, this single source protein meal is perfect for dogs with skin allergies, sensitive digestion and dogs on weight management or low purine diets. 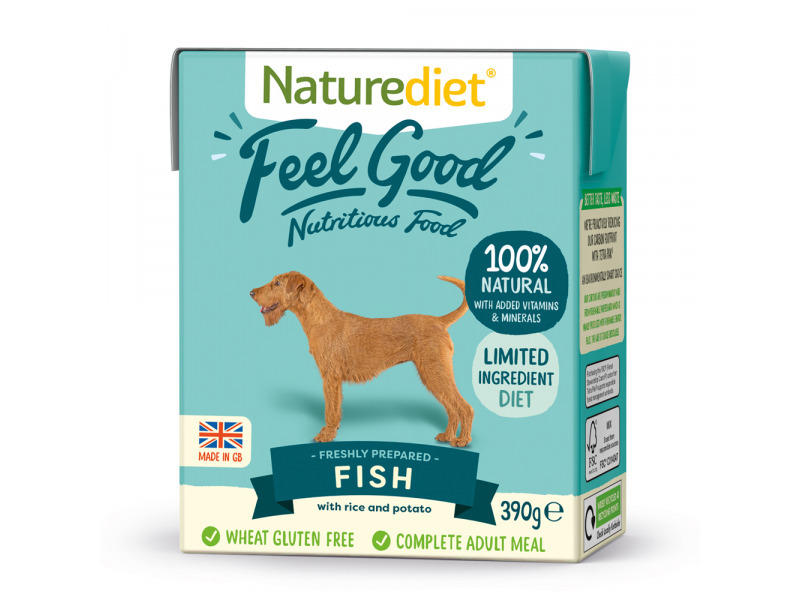 Sustainably sourced white fish with easily digestible rice and tasty veggies, this natural and low-fat meal is designed to provide all the essential vitamins and minerals needed for a healthy balanced and nutritious diet. A simply irresistible steam cooked meal of freshly prepared salmon, white fish, rice and veggies. Gentle on digestion and developed to eliminate meat proteins which may be the cause of allergies. High in natural omega 3 fatty acids to help to promote a healthy skin and coat. 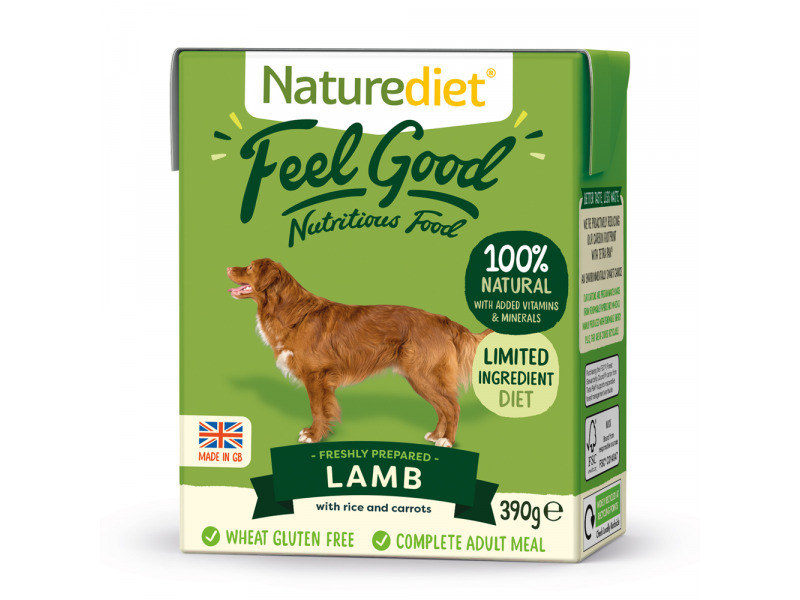 This high quality, complete and nutritious meal will satisfy the appetite of any dog but is particularly beneficial to those will troubled tummies and skin problems. 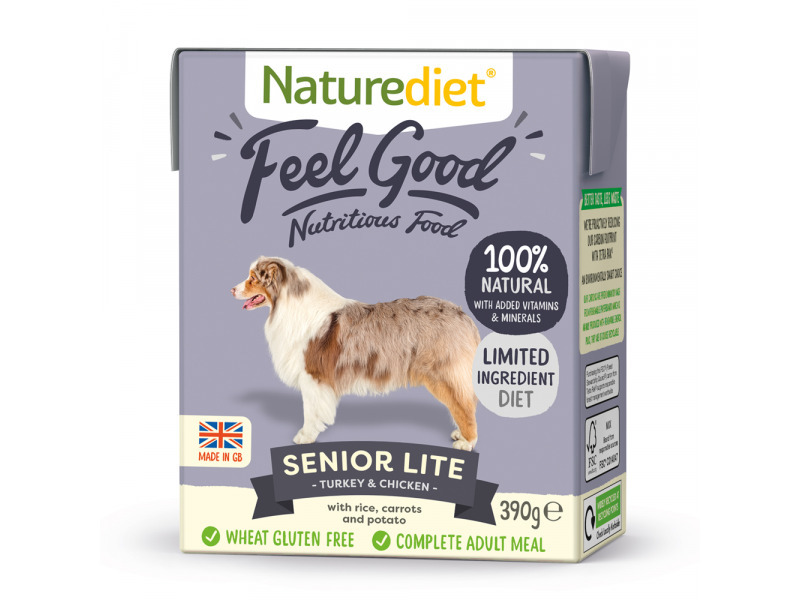 Feel Good Senior Lite is the perfect complete nutritious meal for less active, older dogs, or those on a weight loss or management diet. Appropriate for senior dogs and adult dogs requiring low calorie foods. Below are some recent questions we've received regarding Naturediet Feel Good Dog Food, including answers from our team. 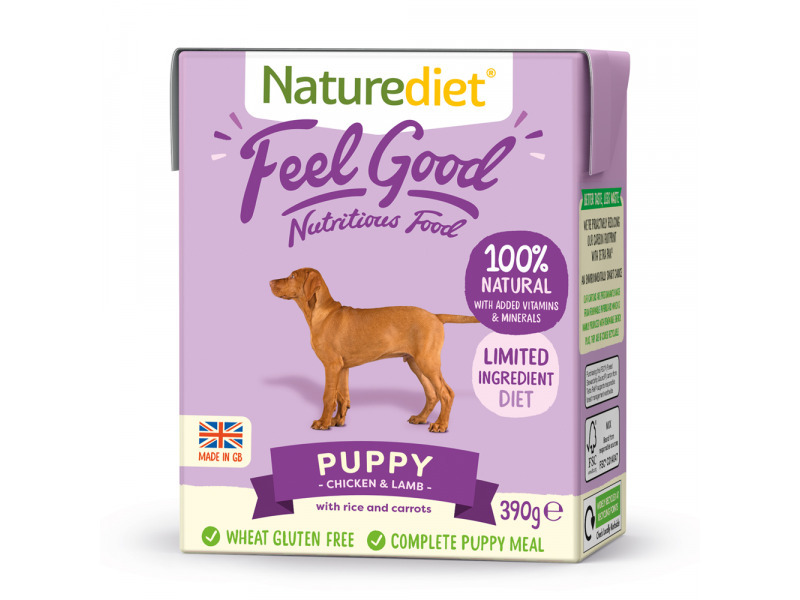 Our dogs have done really well on Naturediet and love it. Please could you confirm that the ingredients in Feel good are exactly the same? Important to know because our dogs have very sensitive stomachs and any would need a transition on to the new food. The only difference is the packaging; the food is exactly the same.